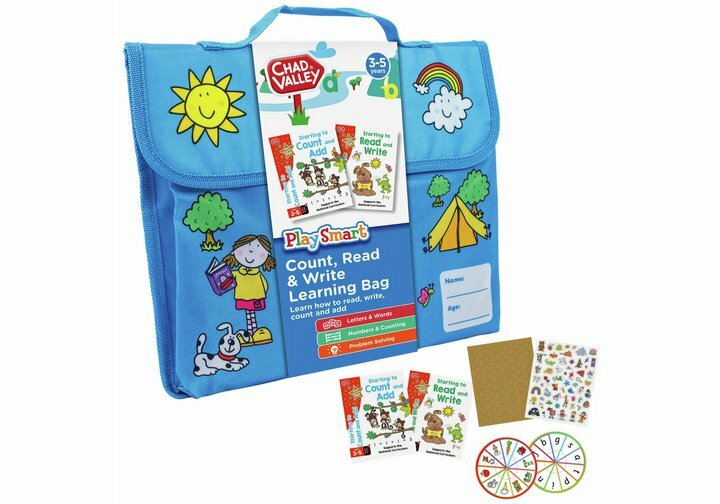 Develop skills at home and assist in your child's learning with the Chad Valley PlaySmart Count, Read & Write Learning Bag, ideal for ages 3 to 5. Positively reinforce the efforts of your most cherished with gold star stickers as they progress through the Early Years Foundation Stage workbooks; make learning an enjoyable experience with engaging activities - the handy double-sided spinner is a great way to facilitate the improvement of spelling and counting. This Chad Valley pack is full of brilliant tools to help kids improve their literacy and numeracy skills. Get money off with April 2019 free Argos voucher codes, see if there's a promo code for the Chad Valley PlaySmart Count, Read & Write Learning Bag product. Argos may be out of stock of this product. To enhance your shopping experience you may also be redirected to a search results page when you click an outbound link.